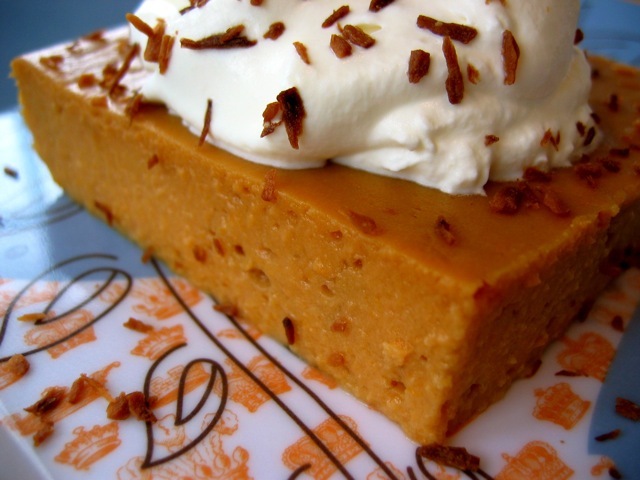 True, sweet potatoes aren’t fruits, but they make a great pudding. Dark muscovado sugar has a molassesy note that’s just right with the sweet potato and the coconut milk. For sweet potatoes, use the orange-fleshed varieties, like jewel and garnet. Yes, they’re called yams, but they really are sweet potatoes. Serve at room temperature with whipped cream and golden coconut strips, or warm with cold cream. If you haven’t sweet potatoes already cooked, chop them into large pieces and steam until tender, about 30 minutes. Peel, then coarsely mash. Preheat the oven to 350 degrees. Put a kettle of water on to boil for the bath. Purée the cooked sweet-potato flesh in a blender or food processor with the remaining pudding ingredients until smooth. Pour the pudding mixture into a 2-quart baking dish. Set it in a larger dish and add the boiling water to come halfway up the sides. Bake until the pudding is firm, 45 to 50 minutes. Before the oven cools, toast the coconut shavings on a sheet pan until crisp and golden, just a few minutes. Once the pudding has cooled, whip the cream and flavor it with the rum. Mound the cream over the pudding, cover with the toasted coconut, and serve. Culinate editor's note: If your sweet potatoes are very sweet (taste them first), cut back on the brown sugar called for, to 3/4 cup or even 2/3 cup.